This edition of Customer Experience Perspectives features some of the best resources compiled by our analyst team for busy customer experience professionals like yourself! Let us know your suggestions and any useful articles we may have missed. All customer interactions matter, but ones that take place via call centers can be particularly important in determining whether a customer has a positive or negative experience with a brand. To navigate these complexities and deliver a seamless experience for customers, many businesses are looking to invest in technologies that help support customers across channels (particularly call centers) such as advanced analytics, VoC, and Omni channel routing solutions. Customer experience (CX) is finally gaining the attention it deserves, with 84% of companies seeing CX as a higher priority than they did two years ago. But, there’s a disconnect when it comes to executing CX transformation, and the underlying issue is a lack of executive buy-in, which is having executives who have less awareness and understanding on CX. It’s true that customer journey mapping will improve your customer experience! A well thought out and designed journey map can help you and your management team gain insight into how your buyer moves through the sales process from visitor to lead to marketing qualified lead to sales qualified lead, and ultimately, to customer. It can help uncover points at which processes and programs can be improved as well as areas where you are excelling. Here are 4 significant steps in mapping your buyer’s journey. Give a read. A big challenge for the air travel industry is that, it has become a commodity product. The emergence of low cost flights, price comparison engines, tight cost margins, unpredictable fuel costs, and holiday comparison sites is forcing an industry that has traditionally innovated in customer experience to take another look at the customer journey. Here are 4 lessons from the airline industry that we could all learn from! Proactive service beats reactive in a crisis. The best marketing investment your company can make doesn’t have anything to do with marketing. It all comes down to three words: reducing customer effort! Instead of providing things like 24/7 call centers to make communicating with customers much easier, it’s unfortunate that many companies still force customers to wade through complicated phone trees with faulty answering systems to get help that might not even be what they are looking for. Give this article a read for some insightful information on how reducing customer effort is a sure-fire way to keep your brand in business. 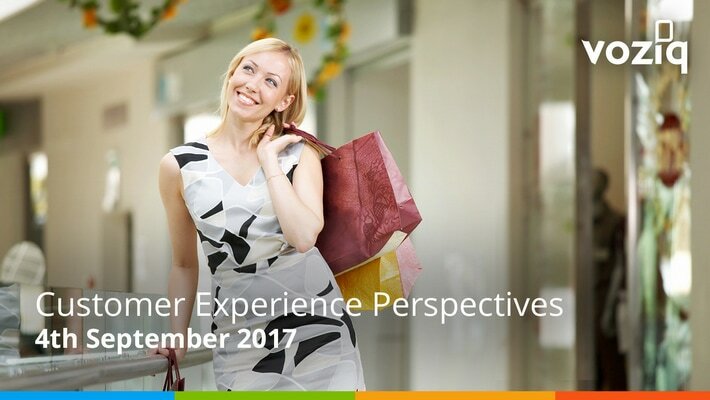 We hope you have enjoyed this edition of Customer Experience Perspectives! Be sure to respond in the comments, tweet us at VOZIQ, or follow us on LinkedIn. Greate pieces. Keeep posting ѕuch kіnd of іnformation оn youг site.